Remember in Disney’s Snow White and the Seven Dwarfs where the dwarfs come marching home at the end of a long hard day in the diamond mine? Well there are seven of us (do not even ask me which one of us is Grumpy or Dopey) and we were glad to march out of the High after six o’clock tonight. 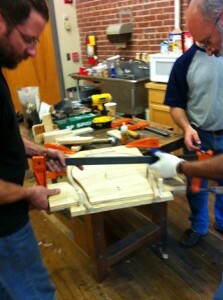 There is zero chance we will not get these Windsor chairs built. A drawknife is a wonderful tool and will do impressivework, but when you are not used to it, most of a day driving one gets to be quite a task. I think all of us were glad when we finished. We cranked up the steam box late in the afternoon and cooked the back bows for about 40 minutes. We pulled the bows out one at a time and bent them quickly and easily around prepared forms and set them aside to cool and dry. We will continue digging tomorrow and work some more on the spindles, and then we will start the seat. Four days to go. Click here to read about Day 4 of Peter Galbert’s Build a Windsor Chair class. 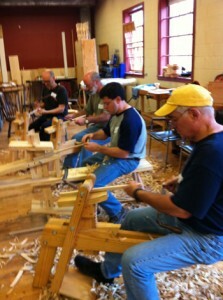 Or, start at the beginning with Day 1 of Peter Galbert’s Windsor Chair class.